The builder mentioned an easy way to build this using a 556 instead of two 555's. I'm trying to keep this as simple as possible (because i need to make a handful of them). *ideally the project would fit in a remote shaped project box (amazon fire TV size) - if not possible that's fine. *any magic China boards from Aliexpress that would help? To use a 556 instead of two 555s, wire it exactly the same but use the pin names of the two 555s rather than the pin numbers. As long as you match the names and they refer to the same half of the device it will work perfectly. With something that simple, there isn't much you can do to make it easier to assemble. Two 100R resistors can be replaced by a single 47R or 51R resistor. If you want an even cheaper and simpler solution that avoids any adjustment, I would suggest a small PIC microcontroller. Something like a PIC200 can produce exact pulses and exact timing with no adjustment and cost about the same as a single 555. If you want an even cheaper and simpler solution that avoids any adjustment, I would suggest a small PIC microcontroller. Something like a PIC200 can produce exact pulses and exact timing with no adjustment and cost about the same as a single 555. Thanks for the feedback! Before i saw this I actually built a transmitter using an Aduino Nano and some code. Now that i have read this I am very interested in the PIC200 method you mentioned. Do you have a part number for the chip? How would one go about setting the pulses and timings on the PIC200? PIC10F200 is the device number, it is an 8-pin microcontroller (or 6-pin in SMD package) and the smallest and simplest of all the Microchip MCU range. The difference in cost between 10F200, 10F202, 10F204, 10F206 and their slightly more powerful 10F22x cousins is very small, they are all very inexpensive and very easy to use. They have factory trimmed internal oscillators so the frequency and timing they achieve is very accurate and they can produce almost as much current as an NE555. You do need to write simple software for them but the tools to do it are free and you need something to program them, again very inexpensive. if you can do it in an Arduino Nano you will have no problem with a PIC device. Use simple software loops to set the timing, although the 10F2xx devices do have hardware timers inside them, they are very basic compared to their more popular 16F, 18F, 24F and 33F products. It looks like the code will need to written in PIC Assembly (this is probably going to ****.. but im game to try). What do you think is it back-asswords? What part numbers would you use for the SST and the MOSFET? If you had to guess how far do you think the completed transmitter would transmit? Thanks again for all your help, definitely owe you a beer or 2 if we can get this cat remote working! That is almost right. You need two more components, a resistor (10K will do) from the collector of 'SST' to +5V and a capacitor of about 1uF (not critical) across the VSS and VDD pins of the PIC. The idea is to maximize current in the loop, for that you need a pulsed switch where the MOSFET is. 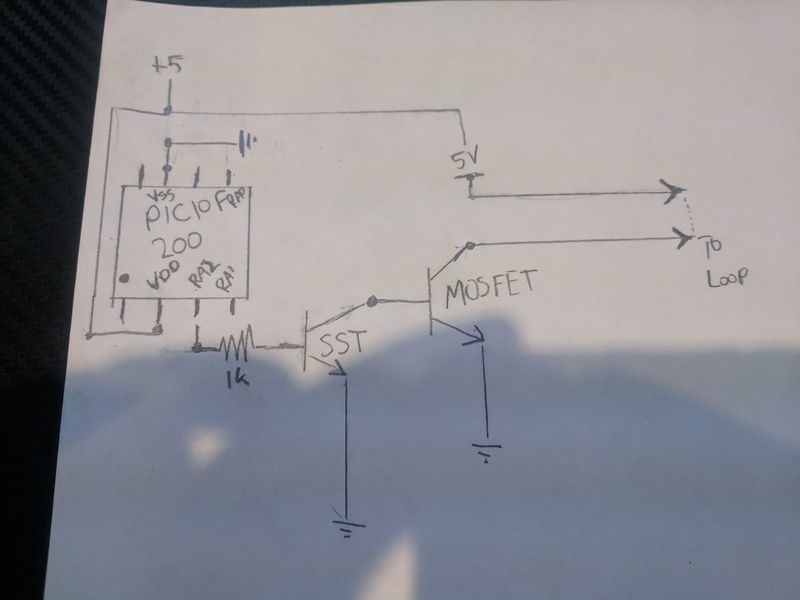 A MOSFET is as near as you will get to a perfect open/close switch to interrupt the current through the loop but it needs as much voltage as possible on its gate to turn it full on. You might be able to drive it directly from the PIC but there are two drawbacks, the first is that MOSFETS hold charge on their gate pins so it takes some current to raise the charge then discharge it again to turn it off, a PIC alone might struggle to do that. 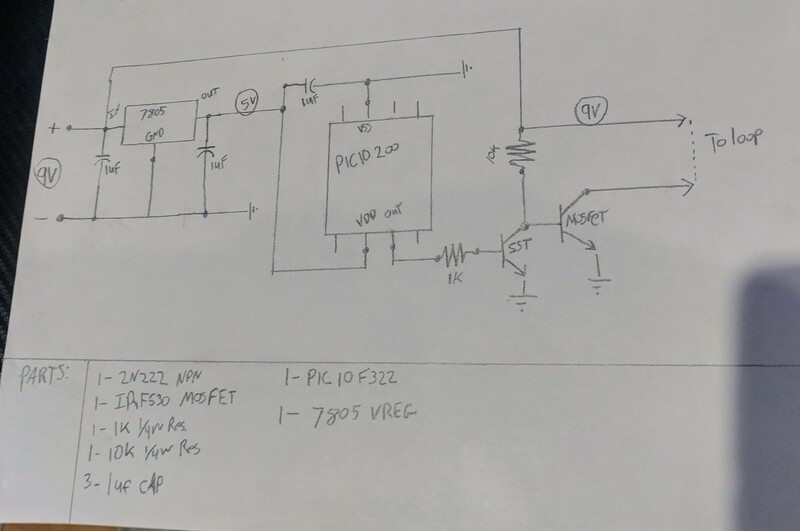 The other drawback is that if you need even more power, it would be possible to increase the supply voltage to the loop (12V for example) but then the PIC's 5V supply (5V is all they can manage) wouldn't be able to raise the gate voltage high enough. Adding the extra transistor overcomes those problems.. If you do decide to run it from a higher voltage, that extra resistor should go to the new supply rather than 5V but you also need a voltage regulator to maintain the PICs VDD at 5V. For the transistors, the types available vary around the World so some may not be available in your country but 2N2222 or similar NPN bipolar transistor will work as the driver and something like an IRF530 would be fine for the MOSFET. The types are not critical but those are fairly easy and inexpensive ones to source. If you use a 10F322 you might be able to program in a higher level language than assembly, probably in BASIC and maybe in 'C'. Assembly is easy though when you get the hang of it. I just checked and Microchips MPLABX and XC8 compilers support assembly and 'C' for that device. Thanks for the quick reply! After reading it I figured i might as well build thing thing to run off of 9v since it is a readily available, inexpensive battery type. I suppose i could just ramp the voltage up for testing once its working to see how it effects transmission distance. I added a 7805 (the caps to go with it), and the resistor you suggested. How does the drawing and parts list look now? Did I miss anything? That looks good. You have the wrong symbol for the MOSFET but we can see what you mean and the transistor I recommended is a 2N2222 not 2N222 but the basic design looks fine.